I DON’T know about you, but I’ve become so used to just throwing on jeans and a t-shirt when I’m with my two boys for the day that I don’t know how to dress when I’m not with them. I feel a bit dressed up in a skirt, but like I’m wearing the same old clothes if I put on anything else. Last week I discovered the perfect day off from work without children look. If you read a recent post of mine, you’ll know I’ve developed a bit of a love of pleated skirts. 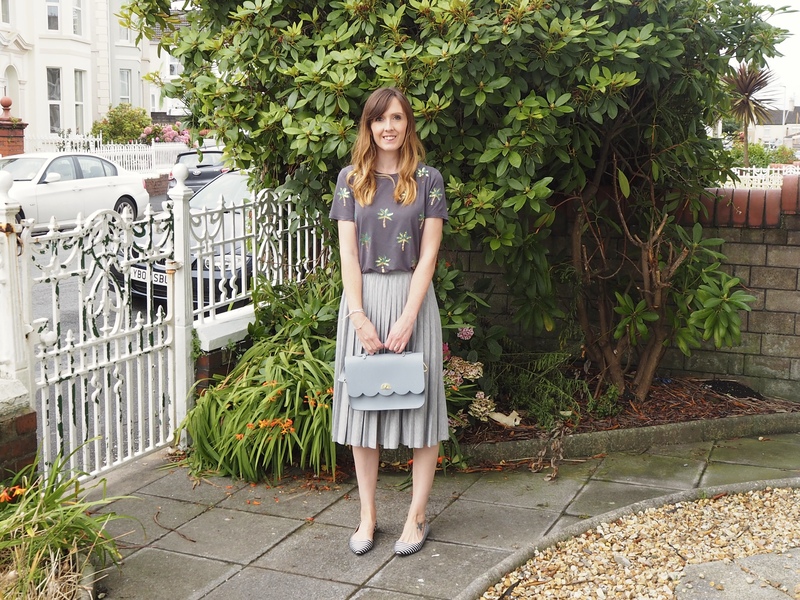 On a trip to Primark a little while back, I impulsively picked up two cotton pleated skirts in grey and khaki green. I kind of stashed them away for a while until one day I decided to wear one to work with a plain black tee. I had so many compliments about the outfit that I realised I was being a bit daft shying away from wearing them. 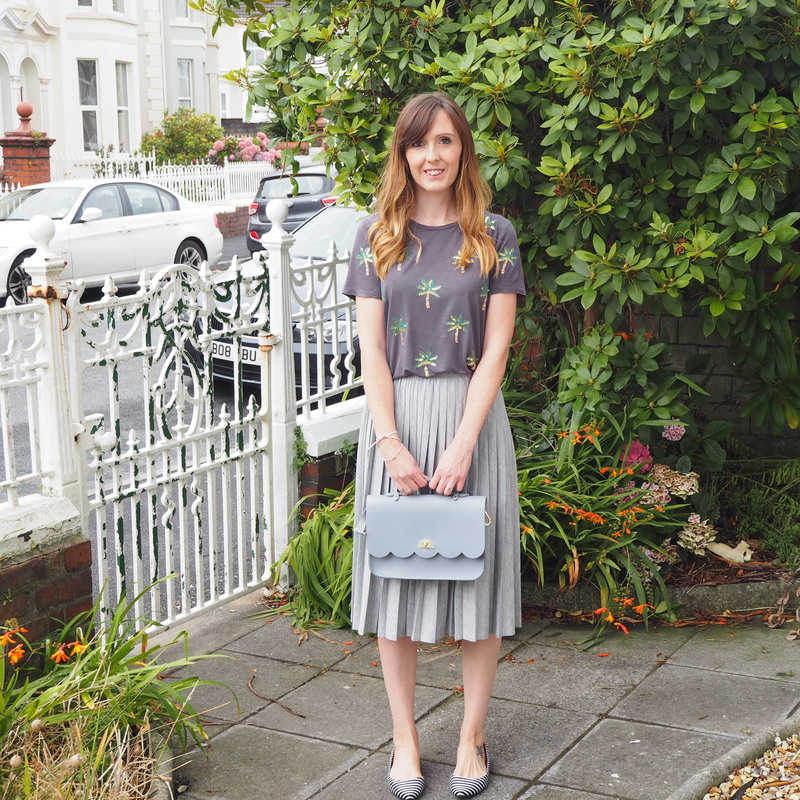 On a recent day off I broke my rule of wearing something on the weekend if I’ve worn it to work (I don’t like my weekend and work wardrobes getting mixed up), and threw on the grey pleated skirt with a dark grey t-shirt with sequinned palm trees. I don’t often feel good in what I’m wearing. but I really enjoyed the outfit. I felt a bit awkward when a lady working in Lush started telling me how nice it looked, and I should have told her not to bother trying to butter me up as I was already intending to buy a couple of bath bombs as a treat! Ignore the shoes in the pic above, I actually wore these embroidered shoes from Topshop – similar here – and used my Cambridge Satchel Company bag, which pretty much remained empty as I wasn’t carrying around the usual supply of snacks, nappies and wipes. What do you tend to wear on a child-free day? Are you more adventurous with your wardrobe than me? !